In the Wall Street Journal's coverage of the concert the president is quoted as saying, “Dr. King himself once acknowledged that he didn’t see ‘the real meaning of the movement’ until he saw young people singing in the face of hostility." There are many picture books that introduce children to Martin Luther King, Jr., the African-American civil rights movement leader. His most famous speech, "I Have a Dream," given in front of the Lincoln Memorial in Washington during the 1963 March on Washington for Jobs and Freedom, is also the subject of many books. Recently I had the chance to review a book about the civil rights movement, Dr. King's speech and the people who traveled to Washington to take part in the movement. The book, Riding to Washington , also introduces readers to two freedom songs that capture the spirit of the civil rights movement. 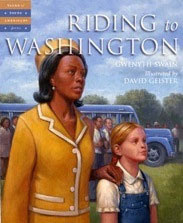 In the book Riding to Washington by Gwenyth Swain, a spunky young white girl named Janie describes her experiences as she rides on a bus from Indianapolis to Washington, D.C., and stands in the crowd watching Dr. King speak at the Lincoln Memorial in 1963. Her fellow passengers are black and white people from several different backgrounds. She encounters acts of discrimination when restaurants won't serve "mixed crowds" and a restroom door reads, "No Coloreds." In one particular eye-opening moment, she stands up for what is right and realizes that Dr. King's dreams pertains to all and that every individual has the power to bring about change. A work of historical fiction, Riding to Washington is part of the Tales of Young American Series and provides a powerful depiction from an unusual perspective of the March on Washington. Swain's own father and grandfather both participated in the civil rights march and parts of the story are based on their memories. David Geister's well-researched period illustrations accurately show the clothing styles and buses found in the 1960's. His painting of the crowd in front of the Lincoln Memorial is particularly awe-inspiring. Interestingly enough, all the illustrations and the text in the book focus not on Dr. King, but on the people that boarded the buses and attended the march. The book's text also highlights a couple freedom songs, "This Little Light of Mine" and "Get on Board, Children." An author's note on the last page provides some historical facts and details the inspiration behind the book. Because the book captures a snapshot of the 1960's, the wording in the book uses terms from this time period like "coloreds." The book would be appropriate for grades 1 and up and would work well for units on the civil rights movement, Dr. Martin Luther King, Jr. Day and Black History Month. In celebration of Black History Month, we made mosaic accordion fan hearts for our stART project. First we made a scribble picture, drawing a continuous, entangled black line that loops all over the paper. Then we colored in some of the scribble shapes in black, leaving the rest white. We cut the drawing into a capsule shape, accordion folded it lengthwise, and then folded the accordion in half to make a heart shape. (Craft tutorial at On a Whimm). For more books appropriate for various ages that embrace Black History, see PBSParents Books that Bring the Black Experience to Life. 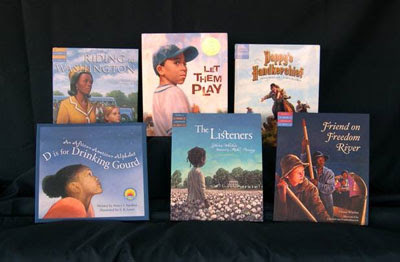 Thanks to Sleeping Bear Press, three (3) Brimful Curiosities readers will win a book of their choice from the six featured Black History month books shown, Riding to Washington, Let Them Play, Pappy's Handkerchief, D is for Drinking Gourd, The Listeners, or Friend on Freedom River. To enter, leave a comment with the title of a Sleeping Bear Press book you would like to win from the six shown. • Contest ends on Monday, March 1st, 2010 at 11:59 PM CST. This looks like a wonderful book, and I can tell i would love the illustrations (I'm a sucker for good pictures). Thank you for the review! This post has great info. And the craft is cute! This is a wonderful selection of books in honor of Black History Month. I would like to have Friend on Freedom River. I'd pick Friend on Freedom River. I would love to win D is for Drinking Gourd. Hard to choose! I'd pick Let Them Play. Great books. I'd love to win Riding To Washington. I would love to have D is for Drinking Gourd. I am now a subscriber!!! I would love to win D is for Drinking Gourd - would be a great addtition to our library. This is my second entry - I subscribe to your feed in my Google Reader. D is for Drinking Gourd is my choice! Great selection! I'd pick Friend on Freedom River. Friend on Freedom River looks wonderful. First edition books are collector's items and are definitely great to own. While first editions of some books can be exorbitantly costly and out of reach for common people, hyper modern first edition books are often available at reasonable price.